Sanskrit, transcription, translation or only the commentaries. Learn how teachers and philosophers interpreted slokas differently. Have you got any questions? Read the comments and find the answers. Another way to explore infinite wisdom of the book. Why should you read Bhagavad Gita? on questions that mankind seek for centuries. The book is a living dialogue between Krishna and Arjuna. to live happily and successfuly in this world, and reveals various aspects of spiritual life. Any help will be very useful, as we plan to actively update the application. The manuals of this work, despite the antiquity, are relevant to this day for everyone, whoever they are and whatever they do. The Bhagavad Gita is one of the most famous and ancient spiritual writings available to mankind. The manuals of this work, despite the antiquity, are relevant to this day for everyone, whoever they are and whatever they do. Her advice is applicable to both the spiritual realm and in the field of philosophy. One can also use it in everyday life. The book talks about the elements of nature, time, activity of living beings and their various consequences. It reveals the basic systems of yoga, the types of faith, the nature and position of the soul and God, as well as their eternal relationship. Now you can study this script in a convenient format directly from your smartphone! We have created an in-depth version of the book for your smartphone, because you cannot take a printed version everywhere you go. 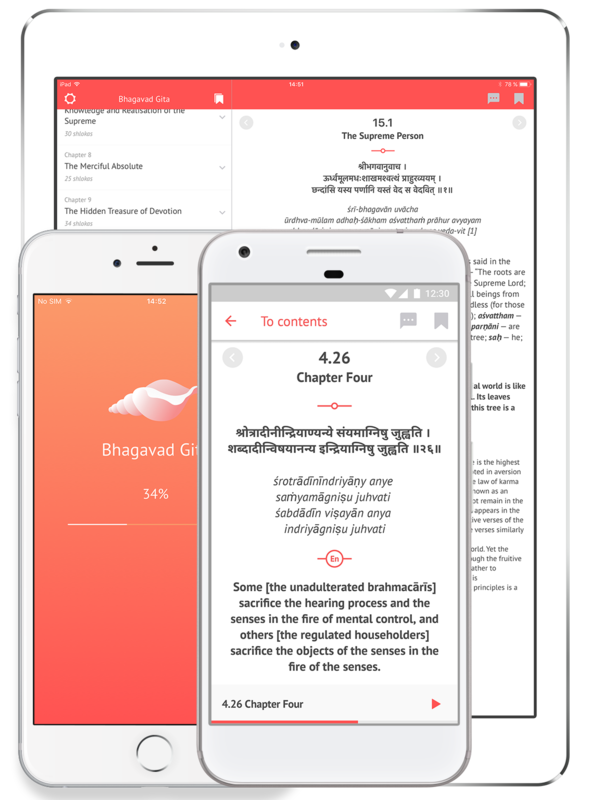 With it, you can read a book, listen to an audio version, take notes and compare interpretations in different languages, anytime and anywhere. Experience the infinite wisdom of the oldest scriptures in the world right now! The Bhagavad-Gita calls on humanity to dedicate body, mind and soul to pure duty and not to become mental voluptuaries at the mercy of random desires and undisciplined impulses. The idea that man is like unto an inverted tree seems to have been current in by gone ages. The link with Vedic conceptions is provided by Plato in his Timaeus in which it states…" behold we are not an earthly but a heavenly plant." This correlation can be discerned by what Krishna expresses in chapter 15 of Bhagavad-Gita. Choose to listen it online, or download to your device. Stay in touch! Subscribe on our newsletter.